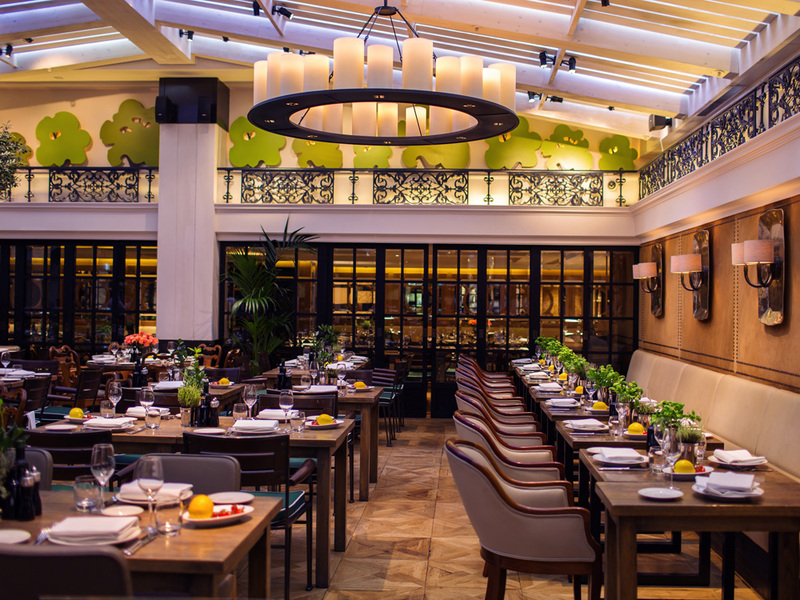 Should you find yourself in central London soon and in need of a quick, but delicious, bite to eat, Novikov Italian is well worth a look. Tucked away on Berkeley Street, Bradley Cooper was recently spotted here – and it’s easy to see why. Head through a swanky Asian restaurant, decked out in bold lighting and suede paneled walls, past a rather impressive wine collection, down some stairs and you’ll come to a serene, garden-themed spot which promises a rustic Italian feast. And that’s exactly what you’ll get. Feeling a million miles away from the hustle and bustle of Green Park just outside, the pretty décor of lush greenery, fresh fruit delicately placed around the room and streams of light through the glass roof make it impossible not to feel relaxed. We ordered two glasses of house white wine and began persuing the menu, which offers everything from a hearty pizza (baked in the wood-burning oven) to fresh fish and plenty of pasta. To start we ordered a bread selection (made daily and far too moorish, it filled us up almost immediately), which came with Mediterranean vegetables accompanied by oils and sauces. For the main event, it had to be the classic Margherita pizza for me, arriving on a traditional wooden chopping board and Dover Sole, marinated in capers and lemon for my friend. Both were cooked beautifully and were perfectly portioned for a midday pit stop. Those with a sweet tooth could well visit for the dessert alone, where you can choose between the lemon tart with raspberry compote, sweet basil Semifreddo or a gluten-free pear and blueberry cake, served with cinnamon ice cream. We ordered the Tiramisu and were not disappointed (light, fluffy and packed with flavour). All dishes were served by the extremely tentative waiter who was suitably educated in wine pairings and helpfully guided us towards the perfect white to accompany our selected lunch menu. The menu is new, and well worth a try. All herbs, salad and vegetables are grown in Suffolk, and should you fancy a light lunch that’s fresh, not too expensive and in a perfectly peaceful setting, this is the place for you. Booking is not essential for lunch and the restaurant also offers an evening dinner menu which looks equally delicious.